Ryan Rua is a middle infielder in the Texas Rangers Organization. Rua was drafted in the 17th round of the 2011 draft out of Lake Erie College. In his 3 seasons with Lake Erie, Rua hit .374 with 24 homeruns and 131 RBI's. Rua was also the first player ever drafted in school history. After being drafted by the Rangers Rua went on to to make his professional appearance in 2011 playing for Texas's Arizona League team where he played in 45 games, hit 3 HR's had 34 RBI's and 5 triples. He was then promoted to SS-Spokane where he played the whole 2012 season keeping pretty good numbers. Rua again hit close to .300 with 7 HR's, and 43 RBI's in games. It wasn't until 2013 Rua got his first full season in professional ball and he exploded on to the scene. Starting the season at Lo-A Hickory where him self and teammate Joey Gallo smashed homeruns for fun. In his 104 games he played with Lo-A Hickory Rua hit 29 homeruns, 82 RBI's, and had a .356 OBP. Rua was also names SAL League Mid-Season All-Star, Post-Season All Star and, was also names SAL Player of the Week on 7/15/2013. He then Jumped to AA-Frisco where he finished his 2013 season with the Frisco Roughrider's. Rua only played in 23 games where he hit .233 with 3 homeruns and 9 RBI's bringing his 2013 total to 32 homeruns and 91 RBI's. Recently Ryan took some time to answer some questions for us. Q1) At what age did you start playing baseball and, who influenced you the most? A1) Probably around 5 or 6 in South Amherst, Ohio...Definitely my dad... but my whole family has always been into sports as long as I can remember. Q2) Besides baseball is there another sport you keep up with regularly? A2) I keep up with all sports, can never get enough. Q3) Was baseball always your go to sport or, was there another sport you preferred? A3) Growing up it was baseball, Soccer, and Basketball... In high school just baseball and basketball, but basketball was always my favorite. Q4) You where drafted out of college in 2011 by the Rangers in the 17th Round, what was the draft process like and where was you when you found out? A4) It was a fun process because we knew it was going to happen with the number of teams that showed interest... I was at home with my family, best friend, and girlfriend listening to the broadcast on the internet. Q5) After playing you first full season of professional ball what was the biggest transition from College Ball to Pro Ball? A5) Definitely the speed of the game, whether it was the velocity or the base running... there were no more easy days or opponents. Q6) You had a breakout year last year. What was the one thing you really worked hard on last offseason? A6) I really got after it in the gym and tried to prepare my body the best I could for my first full season of Pro Ball. Q7) Who was your favorite player growing up? A7) Growing up right outside Cleveland, Ohio and being a middle infielder my whole life I enjoyed watching Omar Vizquel and Robbie Alomar; as well as A-Rod in his Mariners days. Q8) Do you have any personal goals for next season? A8) Just try to repeat the season I had this year, and not to put a lot of pressure on myself...I really wanted 100 RBI's this year and was 9 away so that would be my personal goal. Q9) When your not playing ball what could a fan find you doing? A9) Usually just relaxing in the offseason hanging out with friends and family, or at my brothers high school basketball games. Q10) What is your favorite baseball moment so far? Q10) Probably my walk off grand slam in AA-Frisco after I got called up, never had a walk-off HR before and it was even cooler that it was a grand slam. Q11) Any suggestions for the youth of today that are seeking to be professional ball players? A11) If its truly something you enjoy and love doing then I say go for it. Its a grind every single day, but I wouldn't want to be doing anything else. I was always the smallest kid on all my teams growing up and ended up at a D2 college but when you get your chance you cant hold anything back, it may be the only you get to fulfill your dreams. Ryan Hafner is a pitcher in the Pittsburgh Pirates organization. Hafner was drafted straight out of high school back in 2010. Out of High School Hafner had a fastball that hit the upper 80&apos;s low 90&apos;s. In 2011 Hafners first full minor league season he posted 3.15 ERA, 31 strikeouts, in only 12 games. In 2012 he was promoted to hiA West Virgina where he began the season showing promise getting his fastball up above 90 mph and improving his breaking ball tremendously but not long after the start of the season Hafner aquired and hamstring injury and the season fail from there. Posting a 0-9 W/L, 8.31 ERA, and only 29 strikeouts in 14 games. He also pitched 7 games as a relief role. In 2013 Hafner is out to prove he has overcome the sophomore slump he went through in 2012 and get back to the grinding powerful pitching he&apos;s known for! Recently Ryan took sometime to do answer some questions for us! Q3) Was baseball always your goto sport or, was there another sport you preffered? 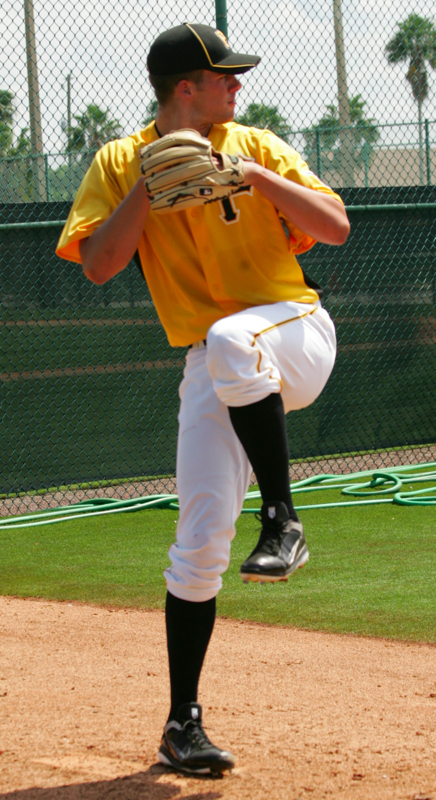 Q4) You were drafted by the Pirates in 2010, what was the process like and where were you when you found out? Q5) You were drafted out of High School, what colleges recruited you and if you had not signed Pitt what college would you have attended? Q6) Who was your favorite player growing up? Q7) Do you have any personal goals for this season? A: Personal goal of the year is to be pitcher of the year in whatever league I am in? Q8) When your not playing ball, what could a fan find you doing? Q9) Any suggestions for the youth of today that have the dream of playing proffesional baseball? We would like to thank Ryan for taking time to do the Q&A everyone please take a moment and go follow him on twitter @RHafner8610 All of us here at The Nosebleed Report would like to say good luck this year! In the 17th round of the 2012 MLB draft the Houston Astros selected a RHP from Washington University Aaron West. West is a 6'1 195 righty that exploded on to the minor league season. The Astros stumbled upon West while scouting no. 1 draft pick Mark Appel. West appeared in Houston's Tri-City team. West posted really impressive numbers in only 12 games. West went 6-2 with a 2.04 ERA, 59 SO, and only 9 walks. Baseball America has West as the No. 29 prospect in the Astros organiztion. West is expected to start off in HiA but if with the hard work he has put in he could see himself finishing in AA or AAA. Q1) What age did you start playing baseball and who influneced you the most? A:I started throwing tennis balls and whiffle balls when I was very young with my grandma. I started playing on teams when I was six and have been playing ever since. My dad was my biggest influence. He was always in the back yard catching for me or throwing to me in the batting cages. He has put in thousands of hours with me and is a big part of where I am today. 2) Besides baseball was there another sport you keep up with regularly? A: Baseball has and always will be my favorite sport and the one I keep up with the most however, I do love football and basketball and will play some golf every once in a while. A: Baseball was and is my go to sport. I love to throw things and be outdoors so baseball is the perfect sport for me. In the winter I would play basketball to help stay in shape. I was never to good of a shot though. Q4) You was drafted by Houston just last year, describe the process and where you was when you found out? A: The draft process is a long and nerve racking one. I watched the first and second days of the draft on TV and my girlfriend’s house with my family and hers. On the second day I got calls from a few teams and they were basically negotiation with me. I talked with my dad overnight and we discussed options and made the decision of the Houston Astros. It was a long process but I feel I made a great decision and haven’t looked back since. Q5) You played college ball at Washington University. What is the biggest transition from College to Pro? A: I would say there were two very big transitions that I had to make. The first was playing a game every day. Throughout college we had a game Tuesday or Wednesday and then three games during the weekend. This allowed for my body to rest and recover. In Pro ball we played every day and I was throwing every day which was a shock to my body but it made me stronger and my arm healthier by keeping up on a routine every day. The second was the freedom we had for workouts and running. In college we had strength coaches and conditioning coaches watching every move to make sure we were pushing ourselves. In pro ball it was up to me how hard I was going to go. This was challenging yet fun because I could make things harder on myself so that I could continue to get better. Q6) You kinda exploded on the scene last year with posting really impressive numbers. What was one thing you really worked hard on this offseason? A: I really hit the weight room hard this offseason lifting and conditioning 5 times a week. I was a little tired at the end of this last summer and I had to shorten up a couple starts. This year I want to be strong and consistent throughout the year. A: My favorite player growing up was probably Randy Johnson. I loved that he was a power pitcher and his presence on the mound was amazing. He was one of the scariest pitchers to face and dominated for many years. Q8) Do you have any personal goals this season? A: I would like to continue where I left off last season. I know that as I move up the competition and hitters will continually get better but if I prepare myself and work very hard I feel that I can compete with anyone. Q9) When you are not playing baseball, what could a fan find you doing? A: Depending on the weather you can find me out on a golf course or on a boat at the lake. When I am relaxing at home I will be watching movies with family or on the Xbox killing time. A: I would have to say dog piling at Safeco field when we won the 4A high school state championship. There was no better feeling than being on the mound and getting tackled while everyone is screaming and yelling and celebrating a huge victory. Q11) What do you think about the Astros new logo? Good Bad? A: I have always loved their old logo and am glad they brought it back. The team played their best in the old uniforms last year. Hopefully that continues this year. Q12) Any suggestions for the youth of today that are seeking to be proffesional ball players? A: Remember the great performances you had in the past or are currently having now because one day you will have a rough game or rough week or an injury and its these memories of success and working hard that will motivate you to work even harder to become the best baseball player you can be. 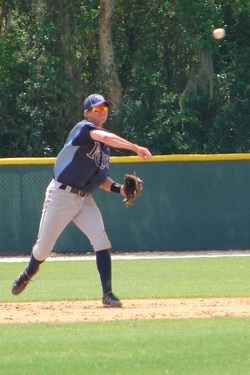 Jake Hager is a shortstop in the Tampa Bay Rays Organization. Hager was drafted in the first round of the 2011 MLB draft. Hager spent his 2012 season with LoA Bowling Green where he posted really good numbers. Hager had an .281 batting average, 124 hits, 10 HomeRun's, 72 RBI's with a .345 OBP. Baseball America has Hager ranked as the Rays #18 prospect. The 19 year old shortstop should start the 2013 season off in HiA Charlotte and with the numbers he has put up in his short pro career and in High School. Don't be surprised if Hager ends the season in AA Montgomery or higher. Recently Jake took some time to answer some questions for us here at the blog. Q1) At what age did you start playing baseball? A: My dad put me on the tee ball team and loved the game ever since. Q2) Besides baseball, what other sport do keep up with regularly? Q3) Was baseball always your favorite sport or was there another sport you preferred? A: Baseball has always been my favorite sport. It is my passion. It has always been my dream. Q4) You were drafted by the Rays in 2011, what was the process like and where were you when you found out? A: The process was awesome... being able to have all the scouts from each team come through the house and talk to you was a lot of fun, and then on draft day it was the most exciting day of my life. I was at my house with all my buddies watching the draft and the Rays called saying they were going to take me at 31, but then they called me at the 30th pick saying they were going to take me at 32 since they took Mikie Mahtook at 31... so once Bud Selig called my name it was the greatest feeling of my life. Q5) You were drafted out of High School, what colleges recruited you and if you had not signed Tampa what college would you have attended? A: I had my 3 colleges narrowed down to ASU, Oregon, and Cal State Fullerton. I ended up signing with ASU. So if I would have went to college i would have been a Sun Devil. Q6) You put up pretty impressive numbers in 2012. What was one thing you really worked hard on this spring? A: The most important thing I have done this off season was gain weight. I wanted to get at the right size for this season and to get stronger. I have been working out a lot and eating a lot to get where I want to be, and I've also just been swinging a lot and doing a lot of sprints. A: Cal Ripken Jr. was my favorite player growing up. I loved watching him play. Q8) Do you have any personal goals for this season? A: My main goal is just to stay focused and don't change who I am and keep playing the way I know how to play. Q9) When your not playing ball, what could a fan find you doing? A: Probably just hanging out with my friends, going to movies, and probably some rebel basketball games. Q10) Any suggestions for the youth of today that have the dream of playing proffesional baseball? A: To always work hard and don't ever let someone say you cant do it. Believe in yourself.